A displacement vessel of a given loaded weight has a theoretical optimum length which minimizes its total (viscous plus wave) calm-water drag. This length is usually somewhat greater than that of conventional merchant or naval ships but is in an appropriate range for competition boats such as rowing shells. Some simple examples are given to illustrate this property. E. O. Tuck and Leo Lazauskas. Web Site Snapshot: If available, above is a snapshot of the Low Drag Rowing Shells web site at http://www.cyberiad.net/library/rowing/misbond/misbond.htm as it appeared when this site was added to the directory or last verified. 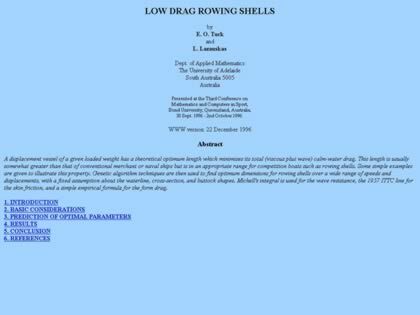 Please Note that Boat Design Net has no involvement with the above web site; all content and images depicted in the above thumbnail are the property and copyright of Low Drag Rowing Shells unless otherwise noted on that site. Description: A displacement vessel of a given loaded weight has a theoretical optimum length which minimizes its total (viscous plus wave) calm-water drag. This length is usually somewhat greater than that of conventional merchant or naval ships but is in an appropriate range for competition boats such as rowing shells. Some simple examples are given to illustrate this property. E. O. Tuck and Leo Lazauskas.